The American paleontologist (a scientist who studies fossil remains of life from long ago) Stephen Jay Gould was awarded the 1975 Schuchert Award by the Paleontological Society for his work in evolutionary (study of the process of change in the growth of a life group) theory. His work gave answers to the missing pieces in Charles Darwin's (1809–1882) transitional questions. He was also the author of several books popularizing current scientific issues. 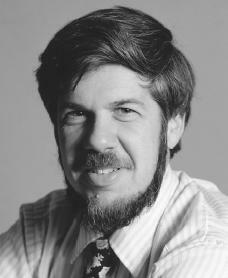 Stephen Jay Gould was born on September 10, 1941, in New York City, the son of Leonard and Eleanor (Rosenberg) Gould. His father was a court reporter and part-time, unpaid naturalist (student of nature). Leonard Gould was a self-taught man who took his son to the American Museum of Natural History when the boy was five years old. It was here that the young Gould saw his first dinosaur, a Tyrannosaurus rex, and decided that he was going to devote his life to the study of geologic (the history of the earth based on the record of rocks) periods. With the support of his mother, an artist, and three well-remembered elementary school teachers, Gould was reading about evolution by age eleven. In high school he encountered the ongoing battle between creationism (a Biblical explanation of how life forms developed) and evolution as Darwin explained it. Darwin remained one of Gould's personal heroes. where he remained for two years. He married Deborah Lee, an artist, on October 3, 1965, then left to take a job in 1966 at Antioch College as professor of geology. The following year he moved to Cambridge, Massachusetts, to take an assistant professorship at Harvard University. In that same year he finished his doctoral work, completing his degree program from Columbia. In 1971 he was promoted to associate professor, and in 1973 to full professor of geology. He also became curator (a person who oversees an exhibit or show) of invertebrate (species without a backbone) paleontology at Harvard's Museum of Comparative Zoology. At Harvard he widened his study of the speciation (the development of a new species) and evolution of land snails in the West Indies. Gould was one of the founders of the school of evolution called "punctuated equilibrium." He argued that evolution proceeds quite rapidly at crucial points, with speciation occurring almost immediately. This could be due to quite sudden genetic changes. His favorite example was the panda's "thumb," a modification (adjustment) of the wrist bone that allows pandas to strip leaves from bamboo shoots. Such a transformation must have occurred all at once, he reasoned, or it would not have been preserved by natural selection (Darwin's explanation of how a species changes to meet its needs over centuries) since it had no useful function in a basic stage. This process would account for the lack of transitional (middle) forms throughout the fossil record, a problem Darwin grieved over but expected to be corrected by future paleontologists. Gould's scientific research and conclusions offer that solution. In addition to Gould's work as a serious professional paleontologist, he spent much time trying to make science understandable to untrained readers as well as to scholars (trained students). As a popular writer and amateur historian of science, Gould concentrated upon the issues of science and culture. In The Mismeasure of Man Gould gave an explanation of the misuse of intelligence testing. Gould admitted that human intelligence has a specific location in the brain and that it can be measured by a standard number score. He argued, however, that any efforts to label groups as having inferior or superior intelligence based upon these measurements mark a misuse of scientific data and an abuse of the scientific process. In 1981 Gould served as an expert witness at a trial in Little Rock, Arkansas, which challenged a state law ordering the teaching of creation science as well as evolution. Gould's testimony argued that the theories of creationism are contradicted by all available scientific evidence and therefore should not be considered scientific. Due to this testimony, creationism was recognized as a religion and not a science. During that same year, Gould was awarded a prose fellows award from the MacArthur Foundation. In July 1982 Gould was told he had mesothelioma, a particularly deadly form of cancer. He recovered from his illness and the treatment, but found that he had to continue his work with a new sense of urgency. Gould used his earned place in biology to argue against one of its central ideas—biological determinism (the belief that individual differences are biologically caused and therefore unchangeable)—and he used his literary skills to make the debate popular. He received important recognition for his work in both areas. In 1975 he was given the Schuchert Award by the Paleontological Society for his original work in evolutionary theory. For his book, The Panda's Thumb, he received two awards: the Notable Book citation from the American Library Association in 1980 and the American Book Award in Science for 1981. Likewise, he received two awards for his other major work, The Mismeasure of Man: the National Book Critics Circle Award for general nonfiction in 1981 and the American Book Award nomination in science for 1982. Gould was also a National Science Foundation grantee. He was a member of several scientific societies—American Association for the Advancement of Science, American Society of Naturalists, Paleontological Society, Society for the Study of Evolution, Society of Systematic Zoology, and Sigma Xi. In 1999 he assumed the presidency of the American Association of the Advancement of Science. His essay collection, The Lying Stones of Marrakech, was published by Harmony Books in April 2000. As the author of more than two hundred evolutionary essays collected in eight volumes Gould was a publishing phenomenon, with topics such as evolution, his battle with cancer, Edgar Allan Poe, shells, why there are no .400 hitters in baseball, and the millennium (period of a thousand years). In an easy-to-read way Gould explained complex ideas in simple, understandable language that bridged the gap between scholars and nonscholars alike. After thirty years of writing for Natural History Gould said he was closing his writing career with his essay collection, I Have Landed: The End of Beginning in Natural History. Gould lived in Cambridge, Massachusetts, with his wife and two children, Jesse and Ethan. He was a talented singer, with a love for Gilbert and Sullivan operettas (romantic, comic operas). His love of life was evident in The Flamingo's Smile: "I could not dent the richness in a hundred lifetimes, but I simply must have a look at a few more of those pretty pebbles." Stephen Jay Gould died of cancer in New York City on May 20, 2002. Gould, Stephen Jay. Ever Since Darwin. New York: Norton, 1977. Gould, Stephen, Jay. Ontogeny and Phylogeny. Cambridge, MA: Belknap Press of Harvard University Press, 1977. This site was extremly helpful for my research project.